Hey there. 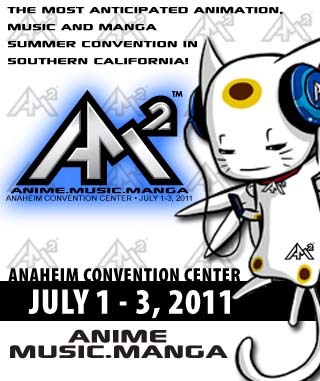 The Anime, Music, and Manga Convention is being hosted at the Anaheim Convention Center this weekend! 3 full days of nothing but put pre awesomeness. If you guys are in the Los Angeles area this weekend, you should consider making the trip to Anaheim to check this out. The convention is free to everyone but there are certain activities and shows that you will have to pay for. Many of the exhibits, workshops, and events are free so there really isn't a reason why you wouldn't want to stop by. Another great perk of going to an anime convention is the cosplay. Some fans will go all out and go dressed as their favorite manga and anime characters. You'd be surprised as to how well thought out and well made some of those costumes are. Who knows, maybe you'll run into someone dressed up as Chi from Chobits! lol It would be real cool to walk around fellow anime lovers and take in all the culture that comes with it. Oh, and did I mention that I'll be volunteering on Saturday! Yup, I've been contacted by the staff and am scheduled to help out! I'm pretty excited about that. I'll admit that this will be my first anime convention so I definitely want take in all the activities so it will be tough to focus on my volunteer work. Nevertheless, I'm excited at the fact that I'll not only be able to go to the AM2 Convention, but am actually a small part of making it happen. It's definitely a family friendly atomsphere but considering that there may be a lot of people at the convention, you may want to keep the younger ones at home. It would be horrible if they wandered off on you and got lost. Go on over to the official AM2 site so that you get all the details, including a schedule of activities for the full 3 days. Check it out and see ya there! Later! that little cat on the animecon poster is cute.